This article was originally published by Matador Network and Teton Gravity Research. JUNEAU, ALASKA—You come for the best when you travel to Southeast Alaska — but you’ve got to prepare for the worst. Rain, whether or not it’s in the forecast, is a foregone conclusion in here. Precipitation governs life in Juneau: when it pours nonstop, you wear your Xtratufs; when it’s only drizzling, you bike to work. The rare evening that brings clear skies will find everyone out of doors—walking the dog, fixing their car, or just searching for a place to start a bonfire and enjoy the sunset. Yet if there is anything that you want to do here, you’d better be prepared to do it in the rain. A paddle out to the ice caves beneath the Mendenhall Glacier is no different. Derek and I aren’t going to let a little rain stop us from enjoying our day off. Sunglasses, at first worn because of the glare from the low-hanging clouds, double as goggles as the mist begins to thicken. A chilly wind, making its way from the Juneau Ice Field, descends from the face of the glacier, making leisure-kayaking increasingly difficult. 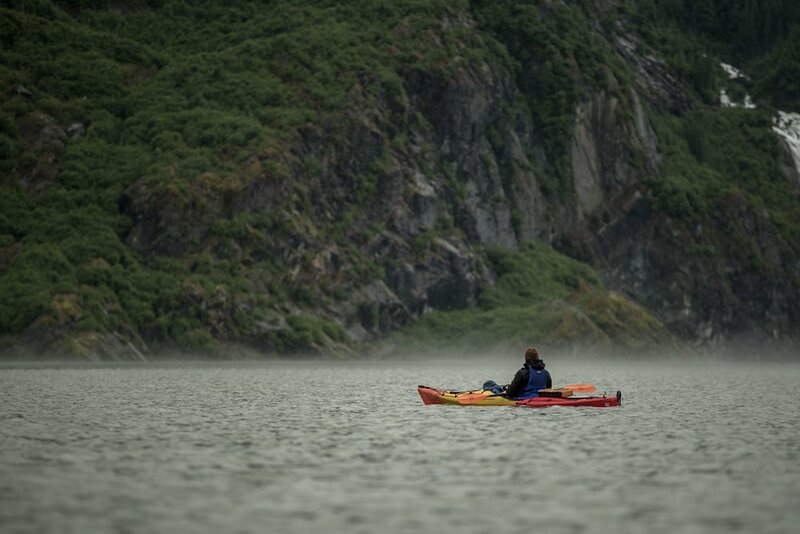 Our narrow, single-seat kayaks make quick work of the deceptively long, two-mile stretch of water separating the only launch site the face of the glacier. Wind, driving rain, and small, albeit annoying, swells stand in our way—though we find ourselves taking more time than necessary. Two photographers in bright red kayaks, against a glacial blue backdrop, means that we’re constantly stopping to take pictures. I thank my lucky stars I brought a dry bag to house my camera. I often hear people remark that from afar, a glacier looks like a watercolor painting. Glacial ice is unlike any other natural phenomenon in the world; and folks often find it to be beyond their comprehension. The deep blue hue — a dynamic, ever-changing color rarely found elsewhere in nature — leaves them befuddled——and curious about how the glacier got to be that way. The enormity of such a landscape is difficult to impress upon others. The fact that the Mendenhall Glacier snakes thirteen miles back from its terminus, far out of the view of those perched at various overlooks built by the Forest Service, is oftentimes bewildering to first-time viewers. So, when you finally find yourself in a kayak, making your way towards the face of the glacier, the enormity of the experience is easy to underestimate. Part of you thinks that if you can just get a little bit closer than those around you—if you can propel yourself into the middle of this swirling mass of freezing, silty water, and away from the masses—that you can understand it all just a little bit better. Yet the pelting rain, and the freezing, relentless winds rushing down from the top of the glacier make it evident that this is not a place where we humans belong for any length of time. We’ve grown up in a society that preaches that we must conquer all that is around us—that we have a right, a duty even, to overcome all natural obstacles in our way. There is no better place than Alaska, with its glaciers, mountains, and freezing lakes, to dispel that notion. Tip over in this water, and at 37 degrees Fahrenheit, you’d have a matter of minutes before shock set in. It’s one of the reasons why such intense focus is required when you’re kayaking; and such single-minded concentration is also part of the appeal for many kayakers. However tempting it might be, it soon becomes clear just how dangerous it would be to touch the sixty-foot face up close. Should the glacier choose that moment to calve, one would be crushed by the force of the falling ice, or capsized by the rippling waves. Derek and I opt for a more direct route, and almost before we know it, we’re making a beeline for the rocky shoals at the foot of the glacier, pulling our kayaks out of the water and cursing the dreary weather that has plagued Juneau for the better part of July. It shouldn’t be surprising that July is a risky time to visit the ice caves—despite the almost constant, bitter chill in the air, it’s our warmest month of the year, and the caves are constantly shifting. As the face of the glacier retreats—at a rate of 200-400 feet per year—the contours of the ice shift, changing the layout of the caves every day. We explore at our own peril. Obviously, there is the risk of them collapsing at any moment—leaving us trapped inside, or dismembered under an avalanche of immensely heavy glacial ice, rock, and silt. That’s not a place anyone wants to find themselves, but the temptation to explore is too great—especially since we want to photograph this beauty. Glacial ice is a brilliant blue, whose radiance is almost beyond description. It is formed by the pressing weight of years of heavy snowfall, so that all of the air is squeezed out of the ice crystals, compressing them tightly. The result is a clear, radiant color—almost a turquoise, that filters sunlight diffused by the clouds like a kaleidoscope. We wade through freezing, ankle-deep water, and gingerly make our way under through the caves, staring up in awe at the crystalline relief above us. Towards the face, the ice is brilliantly lit by the meager sunlight; the back casts ominous shadows—the ice could be a thousand feet or more deep. Trapped and frozen in time, are leaves, rocks, and pockets of clay that have slowly but surely flowed forwards with the charge of the glacier, to be released back into the environment from which they came. From the moment we begin exploring the ice caves, I have a bad feeling. After only a few minutes beneath, Derek and I exchange a look, and know that it’s time to get out of there. Glaciers are ever-changing, especially at their terminus. Ice melts, it cracks, it calves — and this is not a place I want to be when any of that happens. It’s time to get out of here. We push our kayaks back into the lake, and find that the rain has finally abated. The clouds don’t exactly part, but they do take on a brighter shine, and I know that above them is a gloriously bright, blue sky. We likely won’t see it, but it does mean that the rain has moved on for the afternoon, which bodes well for a calm journey back. This way, we find the wind, however gentle, at our backs, and the small swells that just hours ago kept us struggling against the current, are now working in our favor, taking us where we want to go. Every now and then, I find looking back and catching a glimpse of the Mendenhall Glacier. I know that one day soon—perhaps again this summer—I’ll return to the ice caves, and they’ll look different from the way they do now. The world around us is constantly changing, and the caves are no different. I can only hope that one day, when my children come to visit, that Mendenhall Glacier still resembles a watercolor painting.